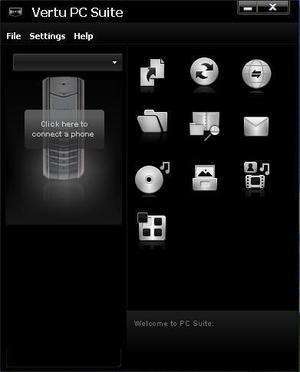 Vertu PC Suite allows you to manage your Vertu phone and its data from your PC. It has been developed to work with your Vertu mobile / cell phone and a Windows-based OS. You can connect your phone to your PC either with a Vertu data cable or with Bluetooth wireless technology. Any software required for the operation of your Bluetooth wireless technology card or adapter should be installed before installing PC Suite. Version 6.86.16 is a freeware program which does not have restrictions and it's free so it doesn't cost anything. For security reasons, you should also check out the Vertu PC Suite download at LO4D.com which includes virus and malware tests. Additional screenshots of this application download may be available, too. Vertu PC Suite download been highly rated by our users.